A few weeks ago I tasted another red wine from the Rhone and noted when tasting it that it harkened back to those frothy days when I bought Beaucastel for £5. 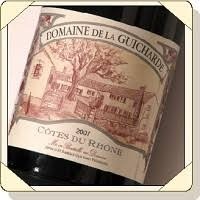 This time the wine is Domaine de la Guicharde. Operated by Arnaud and Isabelle Guicharde, Domaine de la Guicharde is located in the hills north of Avignon around the village of Cairanne. At first glance it doesn’t seem much like a wine region –the village is surrounded by old forests where locals hunt wild boar or wild mushrooms. Nevertheless, in 2005 the quality of the wines in the region was recognized by the French government and given the ability to name its Cotes du Rhone after the village appellation of Massif d’Uchaux, similar to the way the wines of the village of Chateauneuf du Pape was “promoted” to their own appellation in 1923. The oldest vines on the property are 65-year-old grenache vines, which are grown on deep sandy soils with large stones, similar to those in Chateauneuf du Pape. The newer plantings are on very shallow calcerous soil with decomposed fossilized rocks. Isabel and Arnaud work entirely by themselves in the winery, aided only by a team of pickers during the 2 to 3 week harvest. They purchased the winery in 1988 and from the beginning they have tirelessly converted the estate first to organic farming and since 2011 to biodynamic. No fear of chemicals, synthetic fertilizers, nothing. Just two people farming naturally. I can’t say that this is the next Beaucastel. I have come to terms with the truth that finding something like Beaucastel was a one off. However, I have come close a number of times, and this is one of them. This is a wine to buy by the case. The aromas are enticing, they fill your nostrils with crushed blackberry and an earthy, mushroomy aroma. On the palate that ‘garigue’ comes through but is intertwined with flavors of ripe cherry, blackcurrant and a hint of cocoa. At $15 a bottle ($180 per case) this is possibly the best value wine I have tasted and reviewed in a long time. If you wish to purchase this wine please call of e-mail me. The wine is available by the bottle ($18) but I would strongly suggest buying it by the case. If you do buy it by the case and after opening a bottle decide that you actually don’t like it, I will happily refund the difference if you bring the case back within 7 days. I am 99.99% certain that you will like this wine as much as I did when I first tasted it.